Because he wants to improve our disposition. If we feel that Krishna is obsessed with his position, then the counter-evidence stares into our face each time we look at any standard picture of Krishna speaking the Gita. Krishna is situated in the menial position of a charioteer. That’s a position a status-obsessed person would find nightmarish and never choose voluntarily. Yet Krishna freely and joyfully accepts that position on the request of Arjuna because it enables him to serve and love his devotee. Love is Krishna’s primary concern – that’s what he relishes in his own abode eternally, wherein his pastimes of love flood everyone with supreme ecstasy. Krishna’s love is so great that it is not limited to those who love him, but also extends to those who do not love him – to all of us who are missing out an eternal life of love with him. To invite us to that life, he descends and demonstrates his pastimes. But due to our preconceptions, we mistake his pastimes to be ordinary, as just some stories for entertainment. To free us from such misconceptions, he shares Gita wisdom so that we can see reality as it actually is. And that reality reveals Krishna as he actually is – God who conceals his godhood for the sake of love. He speaks about his godhood so that we can appreciate the beauty of his concealing something that glorious for the sake of love. 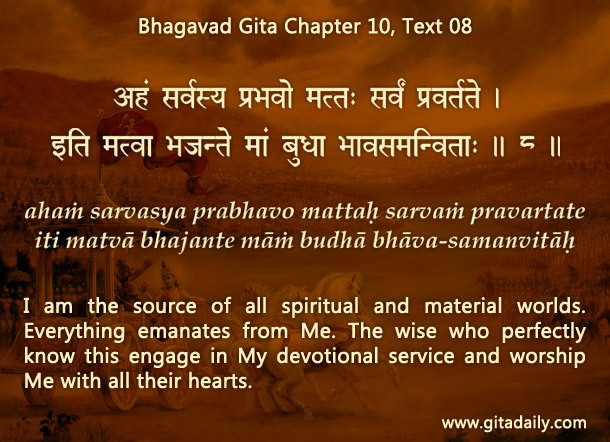 Appreciating his position as the Supreme who becomes the Supreme Lover improves our disposition; it inspires us to love Krishna wholeheartedly, as the Bhagavad-gita (10.08) states. Gita Daily has become an integral part of my daily life. I look forward to reading it every day. Thanks for expressing your love and understanding of Krsna in such a beautiful way every single day. It gives me hope and increases my love for Krsna.